May | 2013 | Beer Apprentice - Craft Beer News, Reviews, Interviews and Info. Hello guys. It’s time for another craft beer review. For today’s tasting I’m going to be trying the Freigeist Pimock developed by Gasthaus-Brauerei Braustelle located in Koln, Germany. Since this is only the third beer I’ve tried from these guys I’ve yet to decipher the consistency or the quality of the brewery. I couldn’t find any info regarding this brew on their website, braustelle.com, so let’s just get it poured and see for ourselves how it is. This beverage came in a 16.9 oz. bottle and it had an ABV of 5.3%. It poured a very cloudy/hazy orange color. Some brighter yellow highlights were shown around the bottom and edges of the glass. The crown was white, a touch small, but mostly smooth and soft. The retention time and the lacing were both decent enough. The fragrance discharged tones of yeast and wheat. Spices of clove hid underneath as did a light citrus. It seemed to have an odd or old musty smell. Kind of like when an old library book is opened after it’s been sitting on the shelf for years. “Dusty” smelling almost. Hmm. The flavor was also very yeasty and wheaty. A very light orange peel and bits of banana were more than welcomed because they added some much needed complexity. All of the characteristics were very light and subdued in my opinion. I found nothing bad, yet everything was just muted. The mouthfeel was medium to thin bodied. Smooth, crisp, refreshing, thirst quenching and quite watery. The carbonation was good, however not much flavor was left behind after each swallow though. Overall, I wasn’t extremely impressed with this beer. It wasn’t undrinkable or anything, but it wasn’t anything outstanding either. 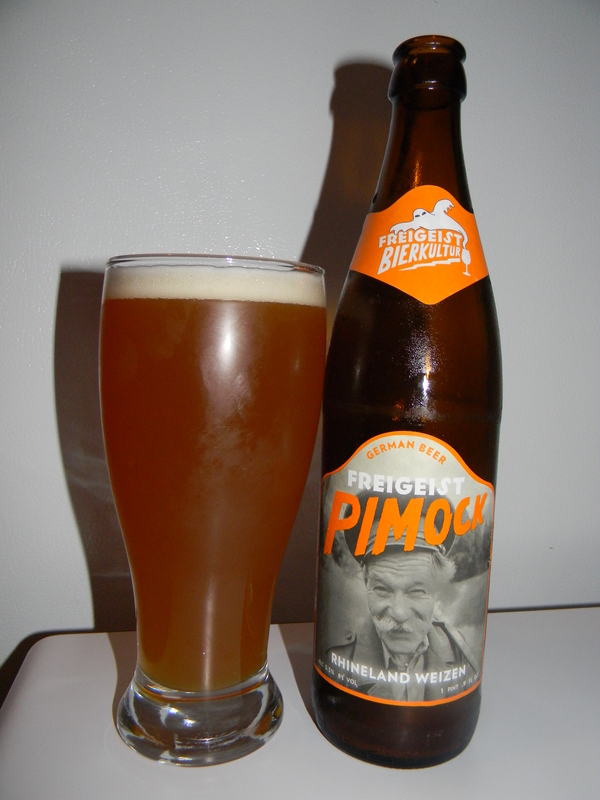 It would make for a decent Summer beer I guess because it was light and the drinkability was very good, however I believe I could find a number of Weizen or Wit beers that have more flavor, complexity and personality than what the Freieist Pimock had. Hey, don’t take my word for it though, pick it up and give it a try for yourself. You may really, really like it. Again, it’s nothing horrible and I’d drink it again if it were offered, but I wouldn’t go out of my way to grab a bottle. Let me know what you thought if you’ve tasted it. How’s it going everyone? Well I hope. 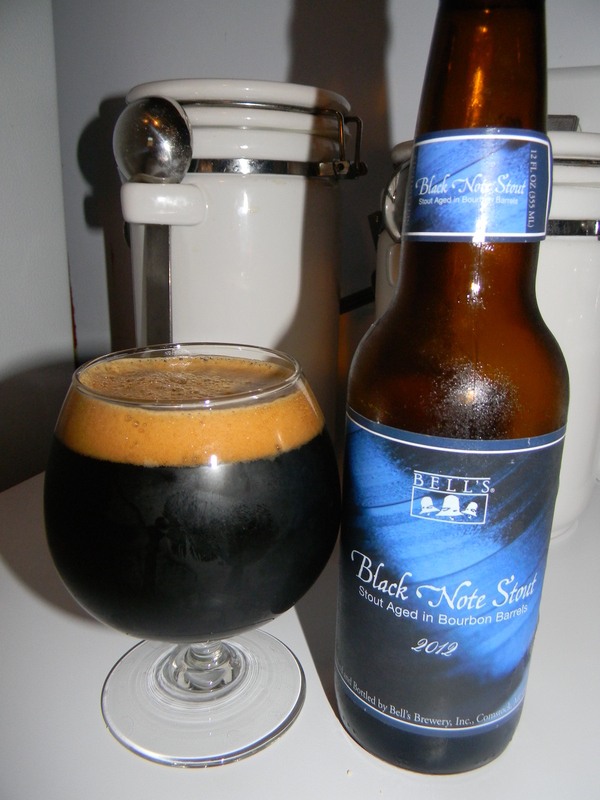 For today’s craft beer review I’m going to be trying the 2012 edition of the Black Note Stout produced by Bell’s Brewery, Inc. based in Kalamazoo, Michigan. I’ve heard some really nice things about this brew, so I’m really interested in seeing how it is. From the website, bellsbeer.com, I found this description. This beer came in a 12 oz. bottle and it had an ABV of 11.8%. It discharged black. Absolutely no highlights shown through even when held toward a light source. The head was tan in color, smooth, creamy and soft. It was sized fairly well and the retention time was more than solid. The lacing was thin, yet it was consistent as the crown settled back into the liquid. After I began drinking though, no foam was to be found. Just a thin skim of alcohol left on the sides of the snifter. The bouquet consisted of dark chocolate fused with decently strong aspects of Bourbon Whiskey. A nice waft of oak and deep espresso followed. Underlying those notes were hints of very light vanilla, dark fruit of plum and black licorice jelly bean scents. The nose was robust, aromatic, complex and…. very nice. The flavor released more of the chocolate and Bourbon tones. The vanilla appeared to be a touch stronger, while the oakiness became more relaxed and the dark fruit complimented. A good shot of roasted coffee bean imparted a sturdy bitterness and as the beer warmed I started to detect some sweet, sugary molasses/sorghum savors. Again, complex and very tasty. The mouthfeel was medium to mostly full bodied. Smooth, chewy, oily, slick and dry. As to be expected, the carbonation was on the lower side. A deep warmth was felt at the back of the throat and on into my belly. Nice!!! A lot of flavor drenched the palate after each sip as well. Overall, I thought this to be a very, very good beer. Probably the best beer in the Bell’s line in my opinion. It is more of a sipper for sure and it would be best relegated for the cooler months of Winter, but the drinkability was surprising good for a brew this big. I’ll tell ya, I’d definitely pick it up again if I happened to run across it. Actually, I’d like to find a couple more bottles. One to drink now and one to set back for a few years just to see how it would evolve. With that being said, give the Bell’s Black Note Stout a try if you have yet to do so. If you are a fan of the big Bourbon Barrel Stouts I have no doubt that you could appreciate this one. Also, feel free to tell me of your experience if you’d like. Hello guys. It’s time for another craft beer review and for today’s review I’m going to be trying the Jolly Pumpkin Weizen Bam made by Jolly Pumpkin Artisan Ales situated in Dexter, Michigan. 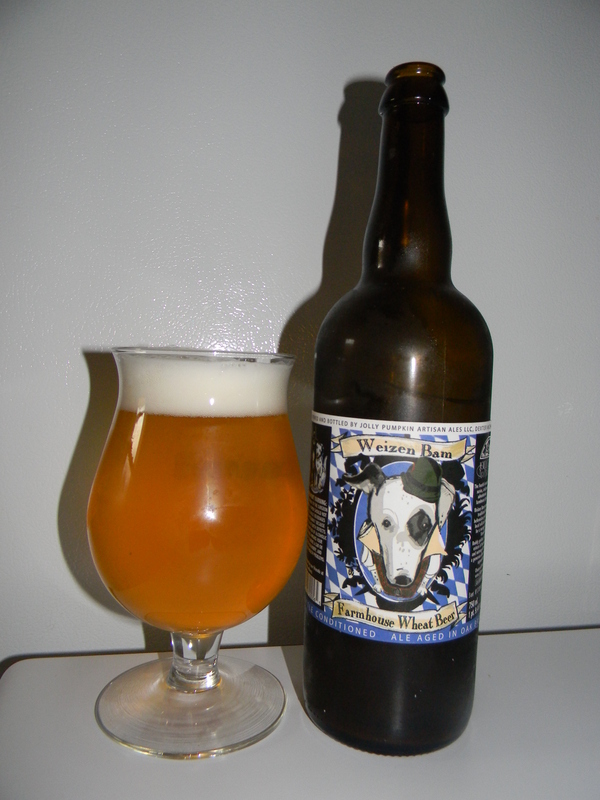 How ’bout we just go ahead and get to the website, jollypumpkin.com, and see what the brewers have to say about this beer, shall we? Ok. Let’s get to drinking. This brew came in a 25.4 oz. bottle and it had an ABV of 4.5%. It poured a semi-hazy, golden/yellow color with a bright white head that was soft, somewhat soapy and a touch fizzy. It was sized well and the retention time was ok, but the lacing seemed to be lacking a little. The nose brought forth hints of barnyard funk and feeble oak along with a very, very slight sour and ammonia smell. Fruitiness of lemon citrus and banana too. A subtle spice of clove, but it also had some nice grassy/grain tones as well. Not bad. The flavor seemed to be less intense, however very similar to the aroma. Savors of light oak, grass and funk. The lemon citrus was a bit meek, which in turn made the sourness pretty sparse. The banana and clove also seemed remote, but I began to pick up on tones of coriander towards the end that I didn’t find in the bouquet. All in all, it was well balanced and good. The mouthfeel was medium to thin bodied. It was smooth, crisp, refreshing and thirst quenching. It was somewhat watery too. The carbonation was of medium strength and the flavor vanished from the palate rather quickly after each gulp. Overall, I thought this was a decent beer. I can see why it is a Summer release. The drinkability was outstanding. I flew through this bottle in no time flat. It would be perfect for those hot days. It wasn’t extremely robust or complex, yet a beer too complex and “thick” is the last thing I need or want on a hot and humid day. So, with that being said, pick up the Jolly Pumpkin Weizen Bam sometime over the next few months and see how you like it. Be sure to leave a comment and tell me your opinion if you feel like it as well. Thanks for reading everyone. I’m most grateful.